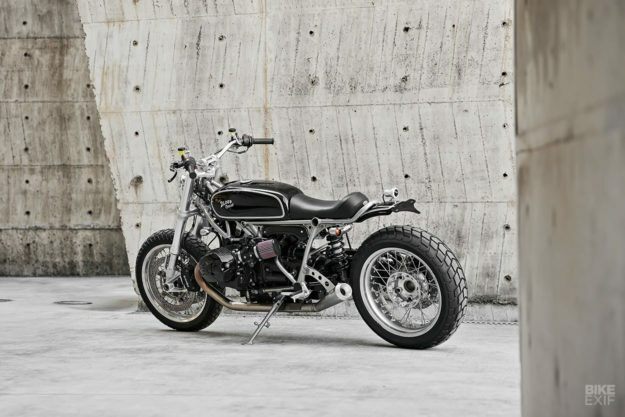 For custom builders, the BMW R nineT is the motorcycling equivalent of Plasticene. It can be pushed and pulled and reshaped in any direction, because it’s easy to take apart: the frame is in four pieces, and the wiring loom is in three pieces. 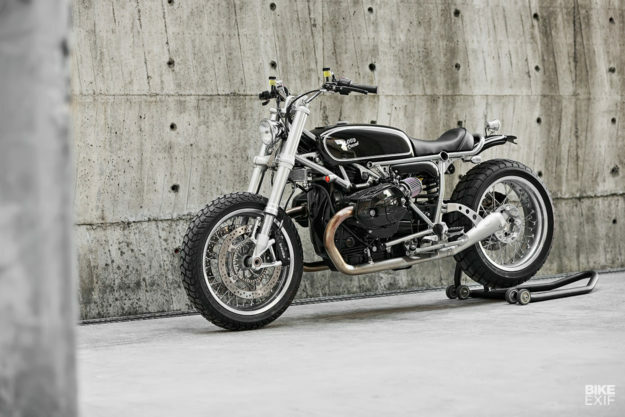 Since 2013 we’ve catalogued every significant custom R nineT; many of the world’s leading bike modifiers have had a crack at the platform. 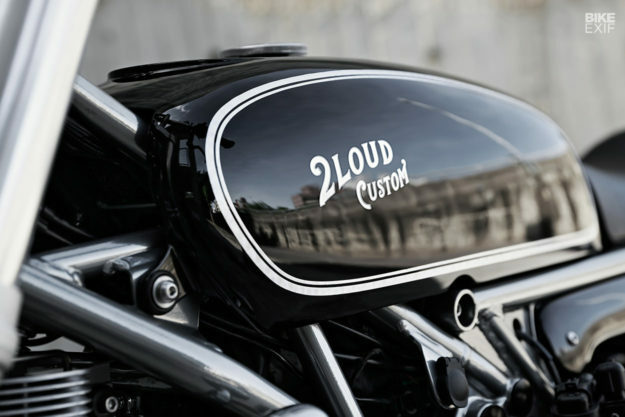 But we’ve never seen anything quite like this latest build, which comes from Max Ma of 2LOUD. 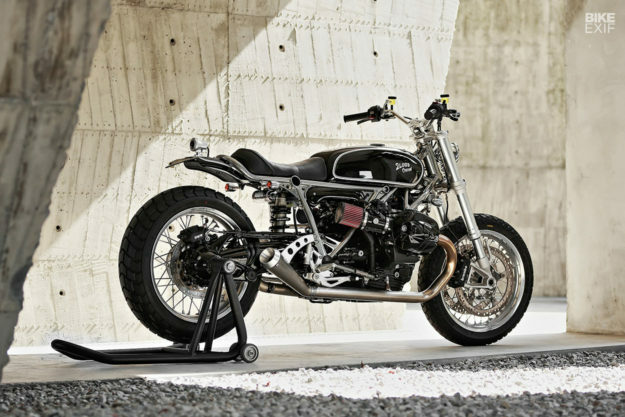 This R nineT is one of those customs that’s difficult to categorize, and that’s what Max wanted. It took him three months to build. Max’s style is a mix of Japanese and Western custom culture. 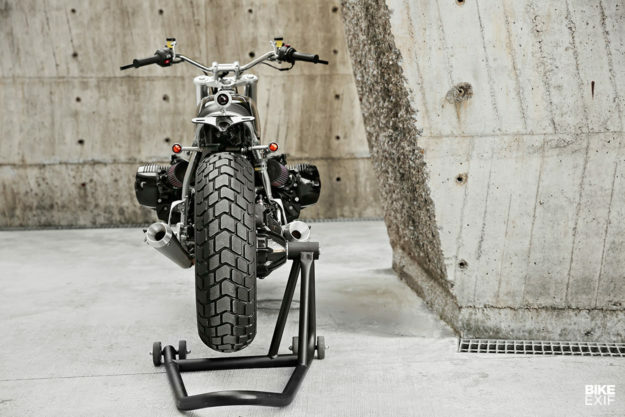 He loves raw metal finishes, uses minimal but effective paint for his bodywork, and imbues his builds with slightly quirky proportions that draw the eye. And his attention to detail is off the scale—at the level of a Mooneyes show winner. Next to come up on the radar is the low-profile tank. Fashioned from a single sheet of steel, it’s slim, compact and totally devoid of ornamentation or styling creases. Finished in a deep, glossy black, it sports slender white pinstripes to provide a subtle link back to BMW’s heritage. 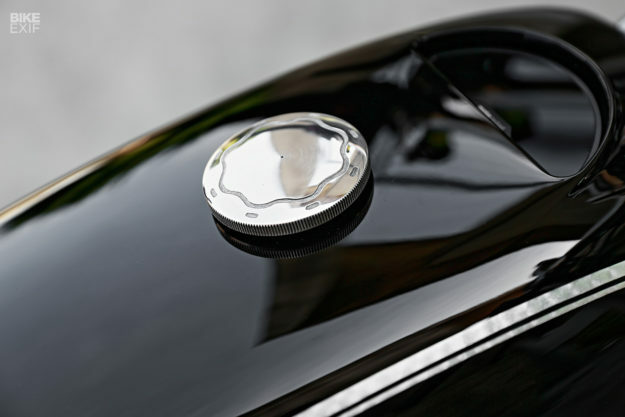 It’s not visible in the shots, but there’s a Motogadget Motoscope Pro digital gauge embedded in the front of the tank—the only ‘plug and ride’ aftermarket instrument available for the R nineT that supports all the functions on the stock bike. The new tank meant finding new locations for several critical parts, including two computer boxes, the ABS unit, a lithium iron battery, the gas pump and several cables. But Max is a master of decorum and it’s an exceptionally neat job. 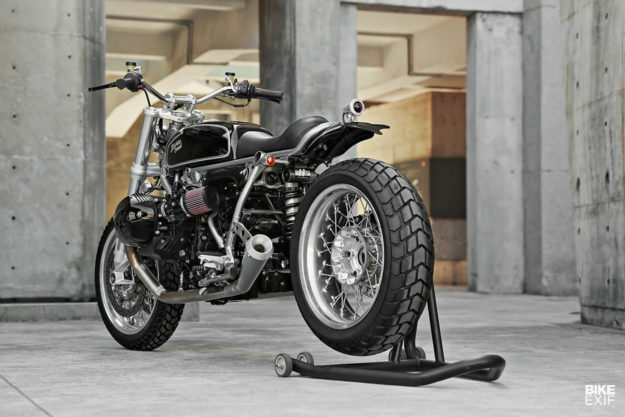 There’s a plush leather solo seat atop the new looped subframe—which also supports a stubby handmade fender, which in turn supports a neat vintage-style brake light, CNC-cut from aluminum. It’s a neat touch worthy of Brat Style. 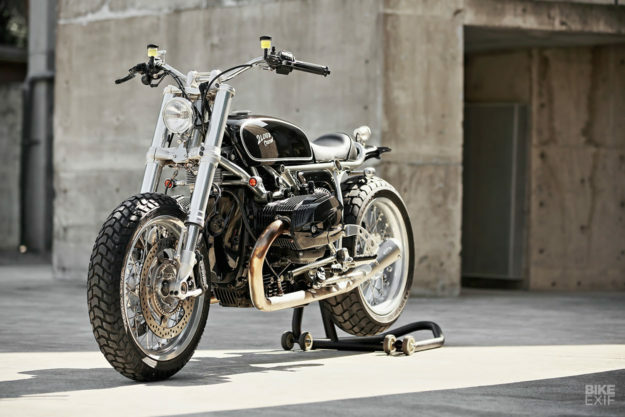 Max has made new bars and risers for the R nineT too, which he’s set high for a comfortable, scrambler-style riding position. 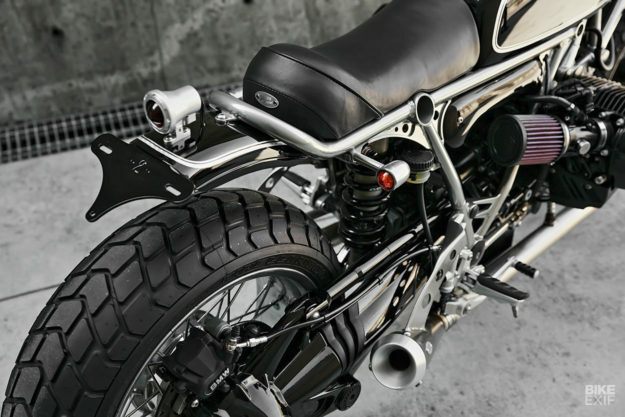 The throttle cabling is run inside the bars for a clean look, and the brake and clutch master cylinders are top-shelf Brembo RCS jobbies. A chromed 4.5-inch vintage-style headlight is tucked deep within the fork stanchions, which have been refinished in a bare metal style to match the frame tubing. The rear shock is an H2 unit from the premium Taiwanese brand GEARS, founded by a group of motorsport engineers. The wheels appear to be bare metal too, but have actually been protected with a layer of gloss metal paint for extended durability. The new rubber is Pirelli’s MT60RS pattern, which is an OEM Ducati Scrambler fitment and has excellent on-road manners. 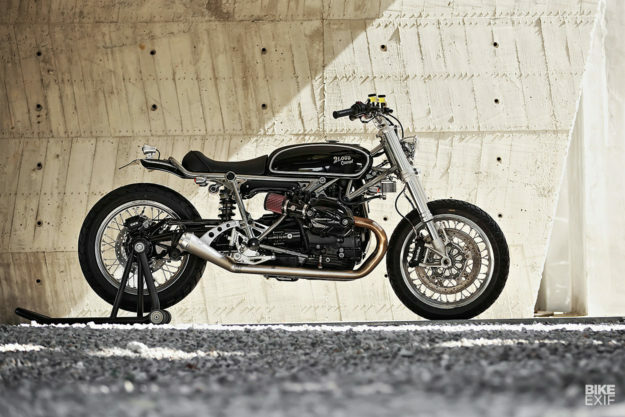 With a substantial 110 horsepower and 119 Nm of torque on tap, the R nineT is not short of grunt. So Max has left the engine internals alone, opting instead to free up the breathing a little with K&N air filters and a simple hand-made stainless steel 2-into-2 exhaust system. 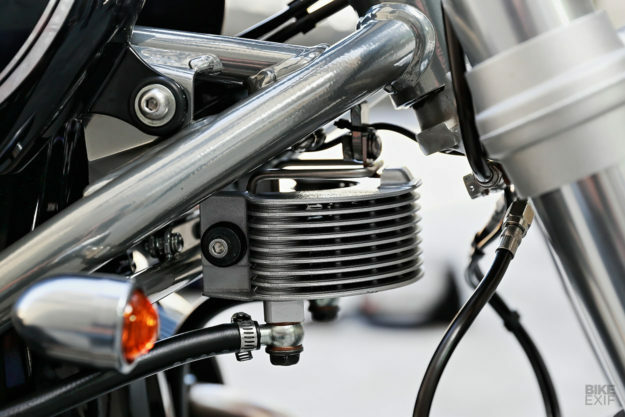 He’s also installed an elegant finned oil cooler, mounting it higher up than the standard item and flanking it with tiny bullet-style LED blinkers. 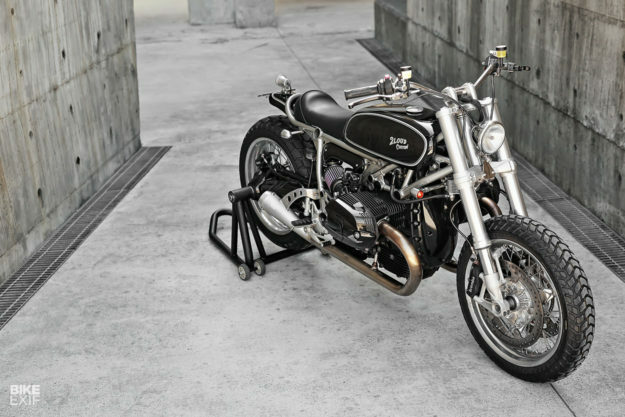 Put it all together, and it’s a stunning piece of work: an unconventional and creative remodeling of a familiar machine, by a builder who is rapidly ascending into the top echelon of the custom world.